JLab 3-part model is sagittally sectioned; both halves can be separated into frontal with parietal lobes, temporal with occipital lobes, half of the brain stem, and half of the cerebellum. This life size model splits into various parts. 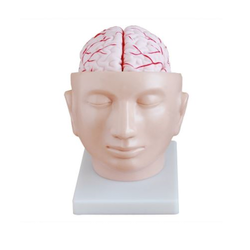 Brain model is made exclusively from high quality medical PVC.The model rests in a plastic base and can be removed for closer inspection. Model shows the human brain dissectable into 2 parts, can be taken out, showing the cranial nerves and the important internal parts of the skull. Numbered with English Key Card. A life size model of the human head mounted on base. Includes: (1) Model, (1) Key Card a 4 Piece, Hand Painted, High Quality Human Brain Model. Shows Fine Details of the Human Brain Anatomy. Comes Numbered With an English Key Card. Glass Agencies EROSE are manufacturer of Human Brain Model. The brain is divided in 2 parts- left and right side. This Human brain model shows parts of the brain.It is mounted on stand and comes with numbered with key card. It is a model of brain with skull, if you need please contact Jasvinder Singh manager of HARPAL SONS firm mob. - Demonstrate external features of human brain as a whole, as well as the relations between the component portions. Dissectible into 3 parts. Mounted on stand. 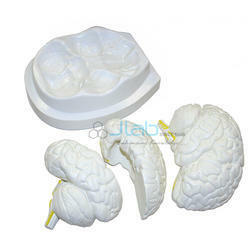 We are a prominent company involved in importing, exporting and manufacturing a premium quality range of Brain Models. Offered Brain Model facilitates the students to get a correct understanding of the external features of the brain and its arterial supply as a whole, as well as the relations between their component portions. Two parts, median section of the Human Brain showing the interior and the exterior structures. Right Brain is corresponding to Left Hand and Left Brain is corresponding to Right Hand. Natural size detailed 4 part sectioned model , The right hemisphere has the cerebellum and the stem with occipital lobe.On base, with key card. We also provide Brian With Arteries On Head model. Keeping track with latest market development, we are devotedly engaged in trading a wide assortment of Human Brain Model.